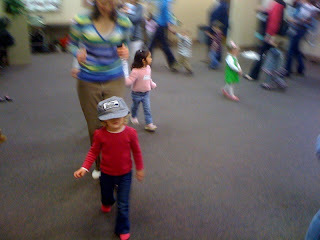 Sierra went to her first music class at a local church. Just something fun for her and Joe to do during the week. He would probably be better at writing this post but I had to share the picture. Sierra volunteered to be the Conductor today. Apparently she had been playing 'shy' with the kids and there was only one lady that she would talk to so when that lady asked for a volunteer to be the Conductor, Si Si jumped at the chance.